Washers have come a long way since the first wringer washers. And while today's machines make the task easier, the choices that must be made before starting the washer have increased dramatically. The choices you make will affect the cleanliness and longevity of your clothes. Small, Medium, Large, or Super Loads. What do they mean? Before you try to guess, read your washer manual. You'll find information to help you make choices about load size. The most accurate method of determining load size is by weight in relation to the washer's capacity. But there are general rules about which setting to use based on the level of clothes in the drum. Choosing the correct water temperature for each load can prevent clothes from fading, stretching, or shrinking. Again, you have a guide on the labels of the clothes and linens. One of the keys to success is sorting your laundry correctly and washing similar items together. Cold Water: Best for dark colors and delicate fabrics. It is also a perfect choice for any lightly soiled clothes like office wear. Cold water will not harm any washable fabric and saves on utility costs. Warm Water: Best for synthetic, permanent press fabrics. Warm water should be chosen for any colored garments that are heavily soiled with oil or stains. Hot Water: Best for white cotton fabrics that are worn or used close to the body like underwear, socks, and bed sheets. If you have laundry that has really heavy soil like work jeans, mechanics' overalls, kids' play clothes, and cleanliness is more important than protecting the color, hot water may be needed to remove the stains. The rinse cycle water temperature should always be cold. This will save money on utility costs and warmer temperatures are not needed for rinse cycles. Using the correct cycle for washing and spinning will help clean your clothes and keep them looking their best. Delicate, Hand Wash, or Wool: These setting are very similar and interchangeable and should be used for delicate, fragile items like lingerie, lace, and silk. They feature lower speeds of agitation or tumbling during the wash cycle as well as lower speed spins. The lower speed and shorter wash cycle will help prevent stretching and ripping of fabric. Rapid Wash or Speed Wash: In an ideal world, you would never use this cycle because laundry would be done in full loads. But this is the real world and quite often there is a last minute need for a special shirt or uniform to be washed alone. This setting has a shortened wash cycle and a high-speed spin to shorten drying times. It is not recommended for heavily soiled items or delicate items. Permanent Press, Wrinkle Control, Casual Clothes, or Dark Colors: This is the cycle to use for most synthetic fabrics, blended fabrics, permanent press clothes, and any colored fabrics. The four cycles are interchangeable and use medium-speed wash action, a low-speed spin, and a cool-down or rest period to reduce wrinkling. Normal: This cycle is for cotton or blended fabrics with average soil. The cycle combines high-speed wash action and high-speed spin, making it harsher on clothes. Heavy Duty: Select this cycle for sturdy fabrics like towels and jeans. It is also appropriate for heavily soiled items. The cycle offers a longer wash cycle with high-speed agitation and a high-speed spin to remove as much moisture as possible. Bulky: Some washers have a bulky cycle for items such as blankets, comforters, rugs, and pillows. The cycle begins with a soak period to allow water and detergent to completely penetrate the items. 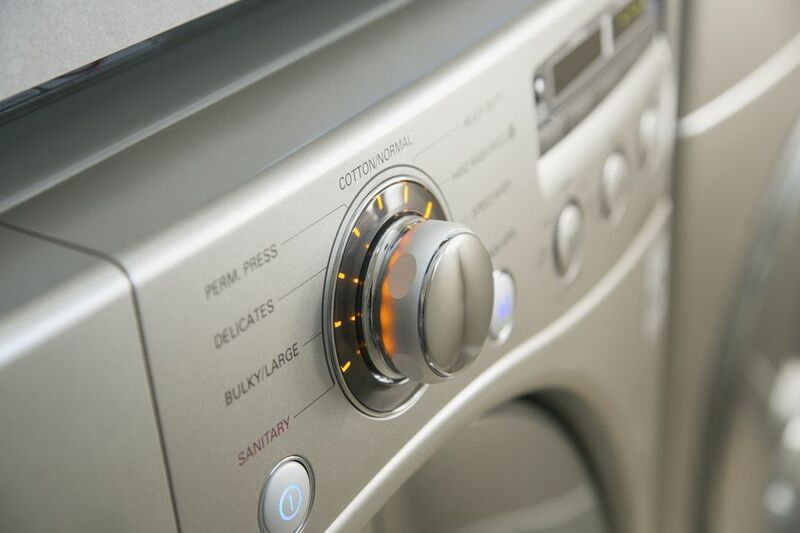 A medium wash action and spin are used to help prevent the washer from becoming off-balance. Sheets: The sheets setting on washers should be used for any linens or large pieces of fabric. The wash action is set to prevent large items from tangling or wadding up into a ball. Whites: On most machines, the whites cycle is designed for bleachable white items. This cycle will dispense the liquid chlorine bleach at the correct time in the washing process. The whites cycle has a high-speed wash and spin cycle. Steam: Many top-level washers now offer a steam cycle. The steam cycle does not wash clothes. It should be used to quickly remove wrinkles and freshen a garment. It does not provide deep cleaning. Rinse and Spin: This cycle does not use detergent or provide deep cleaning. It simply rinses and then spins out the moisture from fabric. Soil Level: Some washers have changeable soil level settings. If you select low soil, the agitation time will be shorter but increases as the settings are changed. Spin Speed: If your washer has settings for the final spin speed that can be changed, select a lower spin speed for delicate fabrics to reduce wrinkling, tangling, and damage to the fabric. Higher final spin speeds extract more water, reduce drying time, and help you select a quicker dryer cycle.